Alice Munro is a name I’ve heard tossed around me for years when I tell people who I like to read. I finally buckled down and started reading two of her short story collections–2001’s Hateship, Friendship, Courtship, Loveship, Marriage and 2004’s Runaway. I don’t think I’ve ever been so quickly and so intensely enraptured with an author, not since Raymond Carver. In fact I think of Alice as a female Raymond Carver–as short story writers, they both focus on rural settings (Munro’s Canada to Carver’s Washington and California) and often feature couples as their central characters. Whereas Carver’s stories all seem to carry a feeling of violence right under the surface, Munro’s carry an acute, deeply affecting sadness. 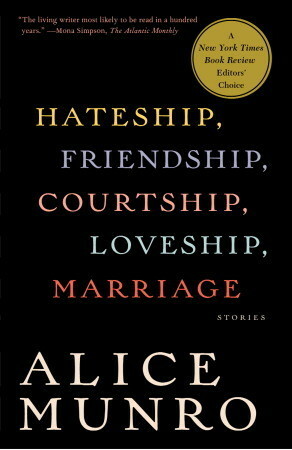 The story from which her 2001 collection was named, “Hateship, Friendship, Courtship, Loveship, Marriage,” caught me off guard with its continuous twists and set the tone for a book full of lonely hearts and unexpected encounters. The story’s protagonist Joanna is a lonely woman who works as a housekeeper for an elderly man and his teenage granddaughter Sabitha. Joanna has found recent companionship through a series of letters between Joanna and Sabitha’s father (who lives across the country since the death of his wife/Sabitha’s mother). The story appears to be a straightforward tale of two sad people coming together, until the point of view switches halfway through and the reader learns that Sabitha’s father never wrote the letters; Sabitha and her friend wrote them. As soon as I reached this point in the story, after Munro set up the first half to show Joanna feeling something for the first time and planning to move across country with the intention to marry, I felt such a staggering sadness at the inevitable letdown and embarrassment Joanna would face over this cruel teenage joke. I won’t give away the ending, but I will say that it was as unexpected as the initial twist. My favorite story, the closing “The Bear Came Over the Mountain” was already familiar to me as a film adaptation from Canadian actor-turned-director Sarah Polley called Away From Her. This is possibly one of the truest love stories I’ve read. It features a retired married couple, Grant and Fiona, struggling with Fiona’s Alzheimer’s. When her illness becomes too much for them to struggle with alone, Fiona is moved into a nursing home, where the policy says new patients can’t receive visitors for their first thirty days. When Grant visits Fiona, he discovers she has bonded with another patient, a wheelchair bound man named Aubrey, whom she appears to have made a deep connection with. Grant struggles with visiting and loving his wife as she continues to fall away from him and closer to her fellow patient. When Aubrey is removed from the home to return to live with his wife, Fiona slips into depression that affects her physical health, and Grant must do something to reunite Aubrey and Fiona in order to give Fiona her happiness back. Interwoven with Grant’s conflict are his memories of past affairs. In an ultimate act of selfless love for his wife, he must make up for his history of infidelities and bring Fiona and Aubrey together. This is the kind of story that makes me wonder what I would do under these circumstances and hope I’ll never have to find out. Munro takes themes and plots were all familiar with–marital indiscretions, serious illnesses–and manages to make them feel fresh. Whereas she could easily dive into sentimentality in the story “Floating Bridge,” which features a protagonist diagnosed with cancer, Munro instead brings new sadness. There is a line in the story that reads, “But she knew now that there comes a time when ugly and beautiful serve pretty much the same purpose, when anything you look at is just a peg to hang the unruly sensations of your body on, and the bits and pieces of your mind.” That is perhaps the most captivating way I’ve ever heard someone’s coming to terms with their own mortality described. Munro never gives you what you want, which may be the best thing about her. The reader knows what should happen to the story’s characters–either what they want to happen or what they know will happen if the story were in less skilled hands. Munro knows what should happen too, she knows where the happy ending lies and the sad one too, and regardless which way she goes it’s not quite the happy ending you expected, not quite the conventional sad ending. The plot turns are always more complex, as though there is something more happening here than a story being told. Her stories are as rich and complex as real life.